William Martin Howell, son of Rebecca Summey Howell, husband of Eva Knight. Eva Knight, daughter of John Tedford Knight and Mary Young, wife of William Martin Howell. Mr. W.M. Howell, 64, well-known pioneer resident of Bartow County, passed away at his home near Cartersville Thursday following an illness of many weeks duration. Funeral services were conducted Sunday morning at eleven o’clock from the Macedonia church; Rev. Baker officiating in the presence of a host of sorrowing relatives and friends. Interment was in the church cemetery; the following gentlemen serving as pallbearers: Messrs. Silas Hardin, John Knight, Joe Knight, Jim Knight, Warren Shinall, Charlie Shinall. Owen Funeral Home was in charge of arrangements. 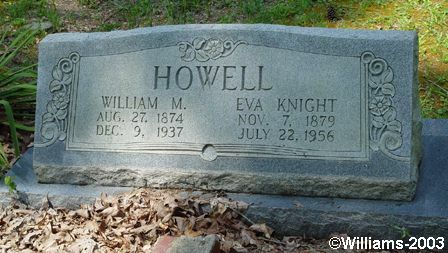 Born August 7, 1873, the deceased was a son of the late Mr. and Mrs. Steve Howell, a pioneer family that settled in Bartow County many years ago. Growing to young manhood, Mr. Howell has continued to make Bartow his home, operating a large farm near Cartersville. He was married forty years ago to Miss Evie Knight. Besides his wife, Mr. Howell is survived by five sons, Messrs. Hubert, Howard, Hoy, Herman and Harold Howell; five daughters, Mrs. Warren Shinall, Mrs. C.J. Shinall, Mrs. Bill Brook, and Miss Myrtle Howell, all of whom make their home in the Macedonia district. Two brothers and one sister also survive. They are Messrs. John and Rob Howell, of this county, and Mrs. Nannie Banks, of Stockton, California. Honest and upright in his friendships and dealings, Mr. Howell will be sorely missed from the community in which he made his home, and friends by the score extend tenderest sympathy to members of the bereaved family. Mrs. Eva Knight Howell of Cartersville, Route 3, passed away Sunday at a local hospital. Mrs. Howell was 76 years of age and had lived all of her life in Bartow County. She is survived by five sons: Hubert Howell, Howard Howell, Hoy Howell, Herman Howell, Harold Howell of Bartow County; four daughters: Mrs. Warren Shinall, Mrs. C.H. Howell, Mrs. W.H. Brooks, Mrs. N.D. Abernathy of Bartow County; four brothers: Charlie Knight, Waleska; John Knight, Madisonville, Tennessee; Will Knight, Bessemer, Alabama; C.A. Knight, Cartersville; 42 grandchildren and 13 great grandchildren; one sister, Mrs. Mary Evans, Atlanta. Funeral services were held Tuesday July 24 at Center Baptist Church with Rev. Raymond Banks conducting the service. Interment was in old Macedonia Cemetery near Allatoona Lake and Owen Funeral Home had charge of the arrangements.